Last week on the New York Court Watcher, we took a first look at the voting records of the Arizona justices in the 10 criminal decisions in which the high court was divided over the past five years. Not many decisions, but revealing nevertheless. (See Arizona Supreme Court: Few Divisions But Notable Revelations in Criminal Cases (Part 1: The Court and the Chief, August 27, 2008.) Now if the graph in that post is rearranged, the voting spectrum--i.e., the ideological pro-prosecution versus pro-defendant spectrum--comes into even sharper focus. The breadth of the range becomes clearer. The differences among the justices a bit more stark. As shown in GRAPH 2, the starkest contrast is between the records of Chief Justice McGregor and Justice Hurwitz--between the two ends of the court's ideological spectrum in criminal cases. At one end is her record of taking the more pro-prosecution position in all the divided cases the past five years (10 out of 10); at the other is his record of taking that position only once since he joined the court (1 out of 6). Other than that sharp contrast, what their records also reflect is that these two justices voted together only once in the divided criminal cases since Hurwitz joined the court. Stated otherwise, McGregor and Hurwitz were on opposite sides in each divided criminal case in which they both participated but one. The point of all this is not at all that McGregor's record is misguidedly lopsided, that she was wrong and her colleagues were right, that there is some ideal pro-prosecution and pro-defendant mix in a voting record, that her more pro-defendant colleagues are wiser or fairer or more open-minded, that she is too conservative, that she cares too much about crime control and too little about due process. No. Not at all. Indeed, the very opposite may be true. Her record is highlighted only because, at 100%, it is easy to use as a basis for comparison with the voting of the other justices. 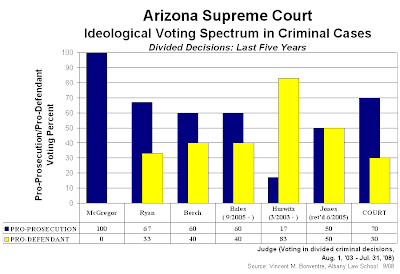 The only point here, and the only one that can safely be made on the basis of these raw voting figures in the 10 divided cases, is that there certainly is a spectrum on the Arizona Supreme Court. On a court that very rarely divides, the divisions speak very loudly. These 10 divided criminal cases are the ones where at least one justice felt too strongly to adhere to the court's near-overwhelming practice of unanimity. And when that unanimity was broken, there were two publicly manifested sides. Each justice had to choose between the strongly-felt openly-taken positions. These choices, the justices' votes in these cases, can tell us a great deal. And some of what they tell us is that, on the tough cases that divided the current members of the court, Chief Justice McGregor was staunchly pro-prosecution; Justice Hurwitz was very sympathetic to arguments on behalf of the accused; and Justices Berch and Ryan were moderately pro-prosecution--more often than not siding with the prosecution (and thus with McGregor), but sometimes finding more merit in the positions favoring the accused. In short, this court, with a 70% pro-prosecution decisional record in divided criminal cases, has a wide spectrum of individual justices' voting records. And those voting records reflect that on any given difficult case that divides the court, both the prosecution and the defense have a real chance of getting the necessary three votes for a majority. And as for the majority, a forthcoming post will look at the alignment of the justices with the majority and the dissent in these criminal cases. It will also look at the sides taken by the justices when they do break with the majority and author or join a dissenting opinion.